Mother's day is coming up. All of us, whether we know them or not, have one. If they are in your life, wonderful. If not, I'm sure you either know of a mom out there somewhere who could use a nice word of encouragement, or just an afternoon of help in her mom-duties. For those of you who are still trying to scramble for a last minute mother's day gift, skip the flowers or the card. It's time you gave the gift of some estate planning and tax advice to the mother in your life. 1. Designation of Guardian of a Child Advance- In Texas, a competent adult guardian of a minor child can designate a backup guardian in case they become disabled or pass away. You can also do this in a Will, but in the event there is not Will, this is a good safety valve. This allows mom to rest easy, knowing that who she wants to take care of her child, will. 2. Help her make a Will- Beat the person who offers just number 1, and help her actually make a will. You can combine the designation of a child guardian, and this way you can set up an estate plan or a trust that will provide the comfort that knowing your children will be taken care of provides. 3. Educate her about Tax Savings- The more kids you have...the more you get child tax credits! Educate the mom in your life to make sure she is getting all the appropriate income tax credits and deductions. See here. 4. Educate Mom about Life Insurance, and Savings Accounts- If your mom has work sponsored or even just a life insurance policy, make sure it is left to the right person(s), or in a way that it will take care of their loved ones. Also, tell them to make sure and check any bank, savings, or investment accounts, to that the proper beneficiary designations are made. OR, scrap all this, and get her some cupcakes or chocolate covered strawberries. 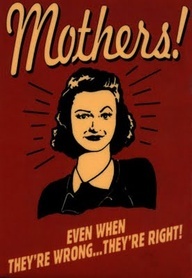 Special thanks to all you moms out there. I, and the rest of us wouldn't be here without you.